Shirts With Random Triangles: Willie Fritz Leaving Georgia Southern To Become New Head Coach Of Tulane. Willie Fritz Leaving Georgia Southern To Become New Head Coach Of Tulane. Willie Fritz. Image via Southern Pigskin. 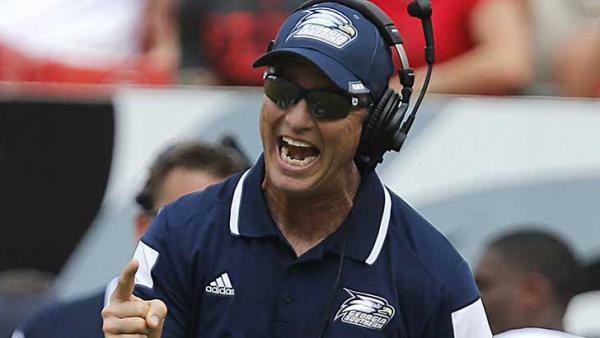 Georgia Southern supporters have a new reason to have them Statesboro Blues. Willie Fritz, the head coach that successfully led the Eagles through the team's first two seasons as an FBS program is leaving to become the new head coach of Tulane. Scott Kushner of The New Orleans Advocate was the first to report on Fritz's hire via Twitter. Sources: #Tulane nearing an agreement with Georgia Southern head coach Willie Fritz. Deal not completed yet. Should be announced today. Fritz has a 17-7 record in his two seasons at Georgia Southern. He replaces former Tulane head coach Curtis Johnson, who was fired following a 3-9 2015 season.